« Petition the USPS for a “Choose Life” Postage Stamp! Pope Paul VI’s legacy as a strong advocate for babies in the womb could be recognized in a special way when he is canonized as a saint later this year. Known for overseeing the Second Vatican Council in the 1960s, Pope Paul VI is expected to be canonized in October. Among his most notable achievements, he published the important church document “Humanae Vitae” in 1968 about the value of human life. The Catholic Herald reports there are hints that the former pope may be named the patron saint for the protection of unborn babies. Both miracles attributed to him in the canonization process involved the healing of unborn babies. 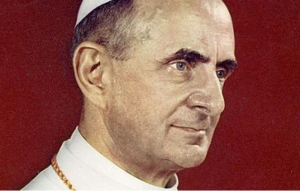 “Paul VI might be invoked as the protector of unborn life,” Fr Antonio Marrazzo told CNA. In both cases, the mother was never in mortal danger, it was not a first pregnancy, and could have ended in the child suffering severe deformities. Doctors also suggested abortion in both cases. However, the children were born healthy. In February, cardinals approved the second miracle, involving an Italian mother who was urged to abort her unborn child. A few days after the beatification of Paul VI on 19 Oct 2014, she went to pray to him at the Shrine of Holy Mary of Grace in the town of Brescia. The baby girl was later born in good health, and remains in good health today. According to the report, another unborn baby in the 1990s in California also was healed after his mother entrusted her pregnancy to Pope Paul VI. The unborn baby boy had a high risk of brain damage and his mother’s doctors encouraged her to abort him. However, she prayed for a miracle and asked for the pope’s intervention in her son’s life. He also was healed and now is a healthy young adult, according to the report. This entry was posted on Thursday, April 5th, 2018 at 5:00 pm	and is filed under News & Commentary. You can follow any responses to this entry through the RSS 2.0 feed. You can skip to the end and leave a response. Pinging is currently not allowed.